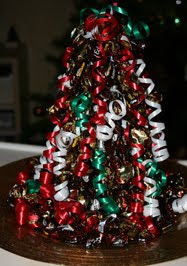 One of our Fam ily Christmas traditions is our "Christmas Lolly (Candy) Tree". I've made it since Shane and Rachel were tiny little humans. It is a polystyrene cone with lots of lollies in wrappers and colourful curly ribbon pinned all around it. I make it about 2 weeks prior to Christmas Day, but the first person to take a lolly from it is Santa on Christmas Eve when he is leaving our gifts. When Shane and Rachel would get up on Christmas morning some of the lollies would have been eaten and a trail of papers would lead to the chimney. Even now with Shane and Rachel all grown up and not living with me anymore, I still make the lolly tree and no lollies are eaten until Christmas Morning. This year I also made Rachel one and she had to make sure Luke (her partner) kept up with our family tradition. One day I will get to make one for Shane and Stacey - it's just a bit hard to get theirs to the top end of Australia in Cairns seeing I am right down the bottom. I like traditioons like that. One of the things that helps to bind family together. You are right there Julie who would have thought when I first started making them that they would become part of our Christmas tradition. By the way I think I forgot to answer your question - my Dad lives with me. Oh, what a pretty, pretty lollipop tree! What an excellent idea, and I love those curling ribbons!!! What a wonderful tradition, I love it! Now this is the type of Christmas stories I love to hear, all about family and tradition! Thank you Davine for sharing!